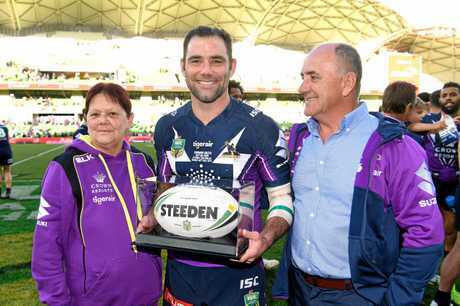 CAMERON Smith has revealed just how close the Broncos and Sunshine State came to luring him away from becoming rugby league's most capped player in its loneliest outpost. 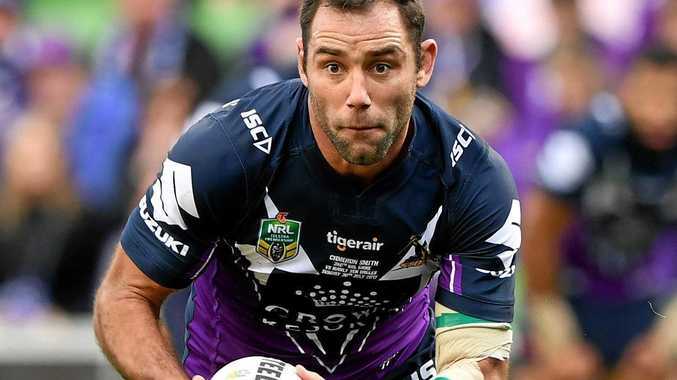 Smith will surge past his great mate and own teen idol Darren Lockyer on Saturday when he leads the Storm out in his record 356th NRL game in Saturday's final against Parramatta. Making the new high-water mark all the more incredible is that on current form, Smith could well play on into another extension beyond 2018 and past 400 career matches, all for a club entrenched deep in AFL heartland, some 1658km south of his Queensland childhood. Midway through 2014 Smith had the bags already packed in his mind when Brisbane came knocking with a $1 million a season offer in the works, and eventually tabled later in the piece. Smith told Craig Bellamy he would be gone by 2015, wrapping up a rugby league lifetime that started with a $5000 contract to a skinny teenager from Norths Devils. Bellamy, though shattered when told of Smith's heartbreaking call, didn't try to convince his skipper otherwise, but spent the rest of the year preparing for life without him. "It was me making a decision in my head first," Smith said of his plans to link with Brisbane four years ago. "I thought I'd come to the right decision when I'd spoken to Craig that day. "I thought it was time to go home and help my wife ... 'Bellyache' didn't try and talk me out of it. He was quite shocked at first. "I think he thought it wouldn't be my thoughts (to join Brisbane), but at no stage did he try and talk me out of it. "He knew that it was a difficult situation for all guys that start a family in Melbourne. It's just you and your teammates. "Both my parents and my wife's parents were back in Queensland and she was trying to raise three children pretty much by herself. I'm away for half of the year, probably more including representative football. "He understood the situation and knew my thoughts around that, but never did he try and talk me out of it." 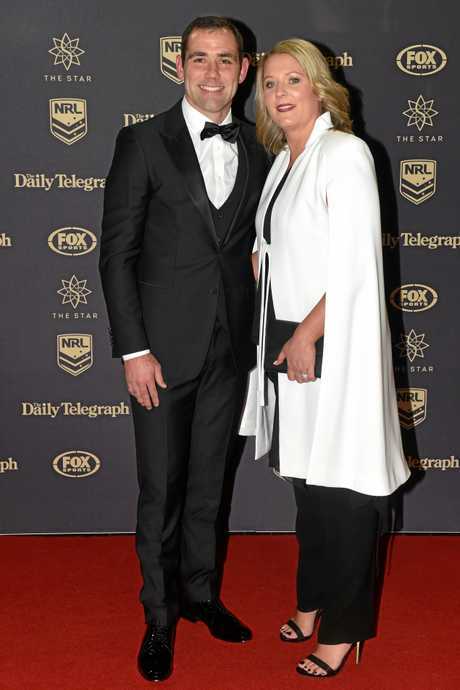 Instead it was wife Barbara that proved Melbourne's trump card, keeping the game's most durable man at its most dominant club for the past decade. "My wife knew, I think she could tell by the way I was getting around, that I was quite uneasy with that decision," Smith said. "Until she pulled me up and told me that although going to Brisbane may be easier for the family, at the end of the day, what will be easier is if I make the decision that I'm comfortable with, and what's going to make me happy. "As soon as she told me that I knew what the decision was - to stay in Melbourne, that's what I wanted to do." Smith admits he never saw himself in the southern capital as a Logan junior, let alone rewriting 109 years of rugby league history. 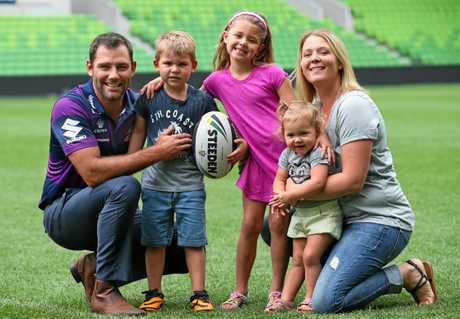 When he first signed with the reigning premiers, then still a fledgling franchise in 2000, there were moments he saw himself back in Queensland by season's end. "My first winter I was thinking 'what have I done here? This is ridiculous'," Smith laughed. "I didn't really ever spend too much time out of Queensland and the first winter it got down to about five degrees and I was out on the footy field thinking 'I don't know how many times I can do this'. "Now being a 300-gamer at the Storm and going past the games record, never ever would I have thought that in my wildest dreams. "I don't think anyone involved in rugby league would've thought that someone would break a game's record playing rugby league in Melbourne. "I'm extremely grateful I made the decision to go to that club. It's a wonderful organisation filled with a lot of great people over a long period of time who have all helped in some way get me to this week."